In my previous post (q.v. 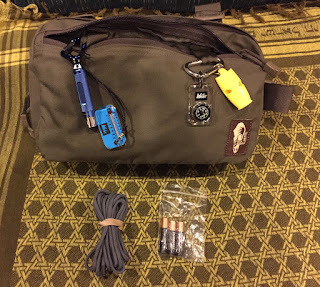 ), I listed the contents of each pocket of my Hill People Gear Original Kit Bag. Since a picture is worth a thousand words, this post should be worth about 6,000 and change. 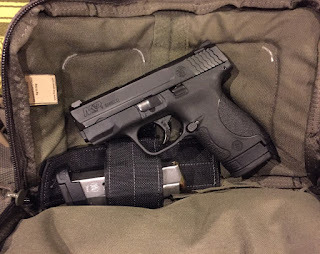 First, the zipped up Kit Bag and then the back compartment with my S&W M&P Shield 9 and a spare magazine. When worn, the pistol doesn't move at all, but I will probably buy a kydex holster that covers the trigger guard. If you click on each pic you should get a full sized version. 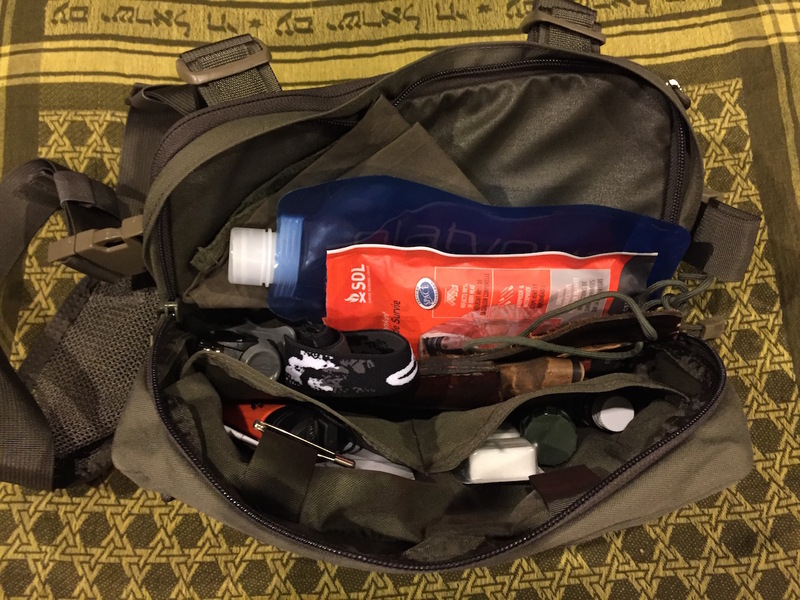 Next we have the middle compartment with an assortment of survival gear. 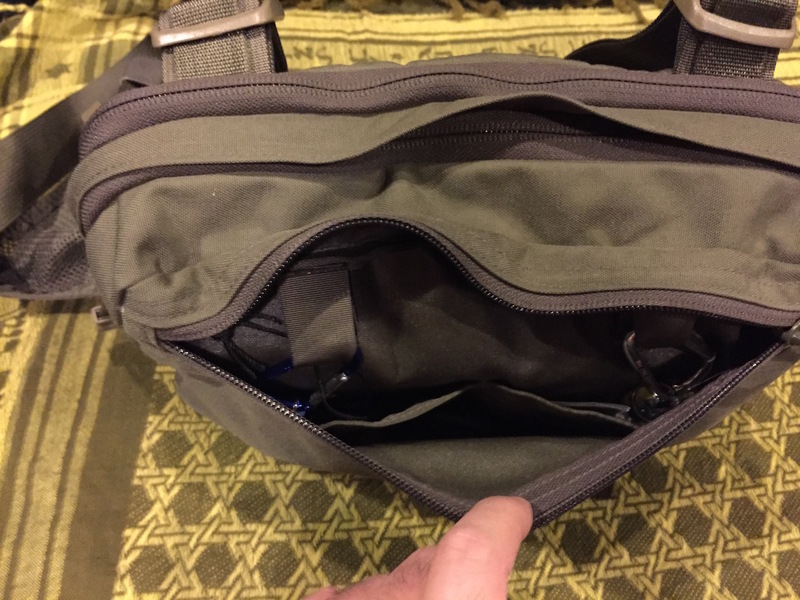 Finally, the outer compartment with a few more items. This is where I stow my keys and iPhone. It provides easy access to the phone without having to worry about everything falling out when I'm consulting the phone's GPS. 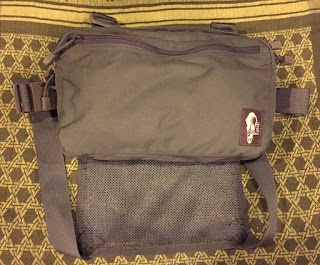 A couple years ago I bought a Hill People Gear Original Kit Bag. 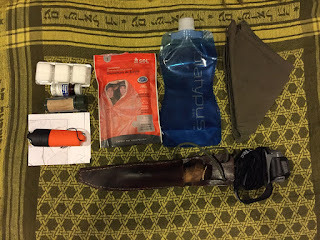 This is the gear that lives in it 24x7. I use the bag on day hikes and overnighters. 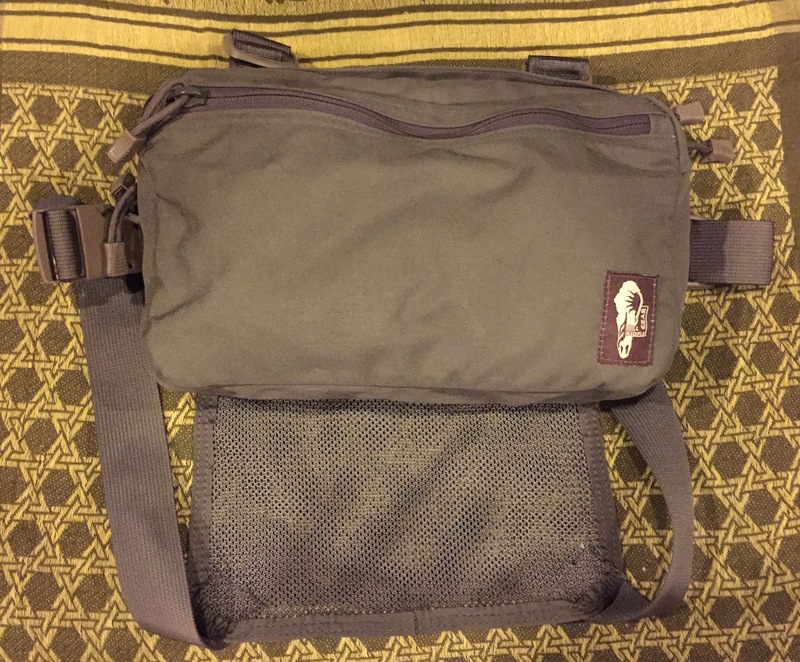 I have found the Kit Bag to be the most comfortable way to carry a pistol while hiking when carrying a pack. 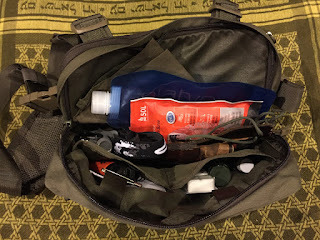 It also provides a very convenient and comfortable means of carrying a basic survival kit, and an easily accessible but secure way to carry my car keys and phone when off-pavement. I augment the contents as dictated by the particular trip. E.g., add a Cliff bar or two. Items marked with an asterisk are dummy corded to light aluminum caribiners with bank line. I replaced the Slick Clips that came with the KB with the 'biners because they are easier for me to open and close. Once I get to the trail, I'll stow my car keys and iPhone 6 in the outside compartment. Depending on the trip I may also bring a larger compass and a Garmin GPSMAP 62 GPS unit, but not necessarily in the KB. Also, I removed the Grimlocks from the outside of the KB, since I don't use them.